The man had been on a journey from Wales to Scotland when he ran off course. THE RNLI HAS rescued a sailor who became stuck after his yacht hit a sandbank in choppy waters. This happened off the coast of Wexford yesterday evening shortly after 6.30pm. A report came in that a 26ft yacht had become stuck and rescue crews were launched from Wexford and Rosslare Harbour. 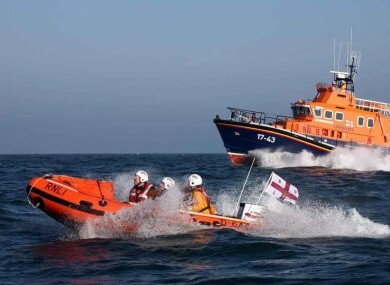 The RNLI sent their all-weather lifeboat and their inshore lifeboat to the Wexford Bar area – known for its treacherous conditions – where they discovered the vessel with one sailor on board. The vessel had disembarked from the Welsh coastal town of Fishguard, and the man on board had been exhausted from the journey. To release the yacht, the crew wrestled to pull up the anchor before it eventually broke, allowing it to be released without damage. Under the observation of the RNLI, the sailor and yacht navigated through the sandbanks back to Rosslare Harbour. This was a challenging rescue but our crew who are highly skilled and trained managed to take the vessel under their control much to the relief of the tired sailor who was on a voyage from Wales to Scotland. Email “Lone sailor saved by RNLI after getting stuck on sandbank ”. Feedback on “Lone sailor saved by RNLI after getting stuck on sandbank ”.